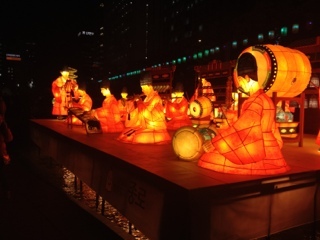 Fall is in full swing here in Seoul, which means changing leaves, wildly fluctuating temperatures, and the Seoul Lantern Festival! In case the name wasn't self-explanatory, the festival is a week-long event when elaborate paper lanterns are set up along one of the major streams that cuts through the city. The lanterns were lit as soon as it started to get dark, so The Gang headed over as soon as we got out of school. It was quite a sight. I was expecting some pretty little spheres bobbing down the stream... not the elaborate tableaux that I encountered. It's amazing to realize that they're all just made out of paper and wire. 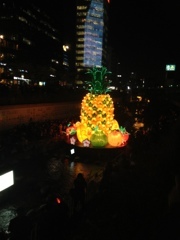 There was even a pineapple, which we found a bit odd, since last I checked pineapple goes for about US $15. I think this lantern was sponsored by Singapore, come to think of it. 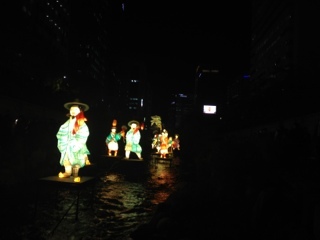 This one depicted a traditional Korean orchestra, and even had traditional music being piped from speakers somewhere. The whole effect was rather haunting. We were a little bummed out that there weren't any actual floating bobbing lanterns that we could affix our hopes and dreams to, but you can't always get what you want. 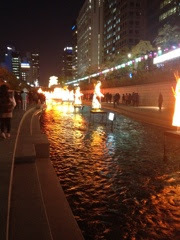 The evening ended in a pretty typical fashion for us (dinner and beer), but it was a great chance to get out and breath some of that polluted fresh Seoul air.